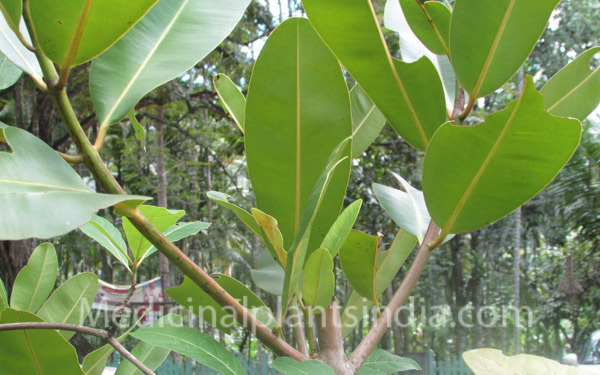 Alexandrian laurel - Calophyllum inophyllum is a slow growing, evergreen tree grows up to 20 meters in height. commonly found in beach areas and backwaters banks of Kerala.The leaves are glossy green, attractive, elliptical, make a dense canopy. The flower is 25 mm wide, fragrant and occurs in racemose up to 15 flowers. The bark is useful in skin diseases, strangury and internal haemorrhages. The leaves are useful in migraine, vertigo and ophthalmia. The seed oil is useful in intramuscular pain in leprosy, skin diseases and scabies. Oil is used to reduce head-ache, the resin is used to heal wounds, Dysentery, to treat cataract, to treat rheumatoid arthritis and cure Vata disorders. Seed yields fixed oil, kernel of seed yields 45-50% of oil with bitter taste, and other constituents are Tannin, kalofiloid, kalofilic acid, Enophilic Acid. 1. Application of oil can reduce Rhumatic artharitic pain. 2. Leaf juice is used to treat catract. 3. Bark resin is used to treat wounds.